A popular economic mantra of the political left is that “profit is exploitation”. Specifically, this idea means that for profit to occur (and for a business to even survive), workers must get “scammed” (by their capitalist overlords) out of a portion of the value that they created. In other words, profit (or wage labor in general) is a form of theft. Let’s create an example scenario. Imagine a person owns a landscaping company and pays employees $10/hour for their labor. However, customers agreed to pay the owners $12/hour per worker. Of course, the owner pockets the remaining $2, sipping lemonade while his poor benighted employees slave away. At first glance, this scenario could appear to be exploitative. However, the problem with this type of thinking is that it only considers a momentary snapshot in time, and not the entire situation. 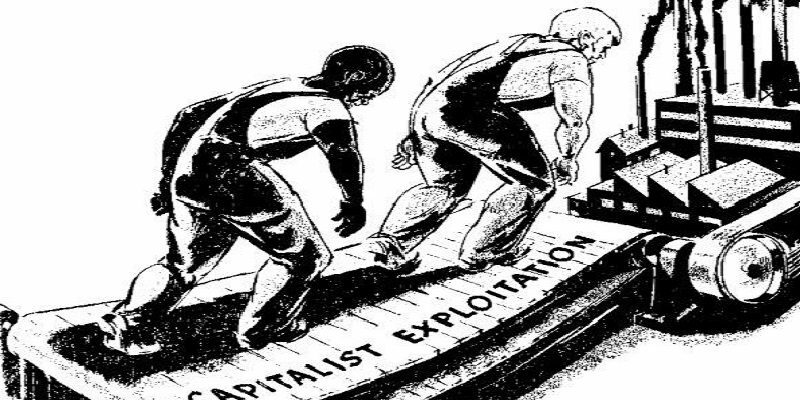 The $2 per hour which the capitalist supposedly “stole” from the workers is nothing more a deferred payment for the capitalist’s own value-added steps. In other words, the laborers themselves are not actually generating all $12/hour of value for the customer, so it makes no sense to pay them the entire $12/hour. But how can this be? Without the workers, the lawns would not get cut, and the customer would not be willing to pay any money at all. Yet, without lawn mowers and other capital equipment, would the transaction be taking place at all? Probably not. Surely, with no mowing machine, customers wouldn’t be willing to pay $12/hour per worker because it would take literally days to cut one lawn manually with scissors or other primitive technology. People would rather their grass grow long than pay the exorbitant fee to have their lawn cut manually. Clearly, the mowing machine is extremely important to this transaction. The “profit” of $2/hour that the capitalist makes in this transaction is simply his payment for value-added steps, (primarily that of providing capital equipment upfront) without which no lawn jobs would be had in the first place. Still, isn’t allowing access to equipment just a “gatekeeper” role, with no actual productive activity taking place? Well, no. Where did the lawnmower come from? Machines do not simply exist, they must be designed and created, and then acquired by trade at a cost to the capitalist. It cost hundreds or sometimes thousands of dollars. The capitalist takes his own money, (which he could have spent on video games, clothes, food, etc.) and bought landscaping equipment in order to serve the desires of local homeowners. To this point, the anti-capitalist may respond, “but once the capitalist has been repaid for their investment, THEN the exploitation starts”. This rebuttal fails to account for the time preference of money (it is better to have money now than later). That is, the capitalist investor forwent spending their money from the time it was invested until the time they are paid back. For the capitalist to simply be paid back would be a net loss, as they would have been better off by holding onto their money from the beginning. Now, knowing the full picture, one would realize that the true exploitation would be for the workers to use all of the capital equipment without the capitalist getting paid at all! So, it can be stated that profit is simply the payment for the capitalist/entrepreneur’s value-added labor. In all voluntary economic transactions, both parties benefit (ignoring the relatively rare exception of regretful decisions). If the transaction were not win-win, both parties would not engage in said trade to begin with. That being said, both parties must value what they are gaining more than what they are giving up in the trade. In all deals, there is generally some “wiggle room” that each party would tolerate. After all, how likely is it that all trade prices are exactly what the buyer is willing to pay and not a penny more or less? Anti-capitalists will use this nature of trade to attack wage labor. They claim that because the capitalist is receiving more value than he or she is paying (as is the nature of ALL voluntary trades), the worker is necessarily getting less than the full value of his or her work. Yet somehow, they conveniently forget that the worker is ALSO receiving more out of the transaction than he/she put in, again by the very nature of voluntary trade. So, if one is to criticize wage labor because the employer receives more subjective value than what they pay the employee, then one must equally criticize the employee for engaging in the very same “exploitation” and condemn ALL trades for the same reason. Should we ban all trade? Clearly, this argument becomes absurd when it is extended to its logical conclusion. All human interactions are “for profit” in the sense that we are all acting to better ourselves in one way or another at all times. There is nothing wrong with this. Further confusing the issue is the argument that a company would never “overpay” workers and stay in business long term, because “overpaying” workers would make the company experience a net financial loss. This criticism only holds water in the instance that a capitalist is literally producing no value whatsoever but instead simply acting as a purely parasitic middleman. However, this is almost never the case because, as explained already, being a pure parasite is unsustainable; employees quickly realize that they would be better off by abandoning their parasite. In the above landscaping company example, it would be perfectly permissible to increase worker pay beyond what any other landscaping company was paying and still remain profitable, because again, the value added by the capitalist still remains. Would this count as overpaying? If so, “overpaying” can be a very misleading term, because as long as the capitalist is producing value, “overpaying” is not necessarily unsustainable. Is it possible to underpay workers? Of course. Does this prove that profit is inherently exploitative? No, of course not. It is possible to overpay workers? Yes, absolutely, even in the long run. An even more ridiculous yet somehow pervasive idea among communists is that employee workers own the objects that they create, despite using tools and materials that they don’t own, and voluntarily working under the terms that they voluntarily sell the product of their labor in exchange for money. So, no, a factory worker doesn’t own the entire value of the car that he or she slaps together in an assembly plant, and the construction worker isn’t due the entire value of the house he or she builds. Similarly, a leftist would probably label banks as exploitative, because they lend out money and collect interest, which apparently requires no work at all. The funny thing is that money doesn’t grow on trees, lending has risk, and spending money in the present is always better than spending it in the future (life is short). Critics of capitalism love to paint a one-sided picture wherein the employer wields massive power over the employee, yet this isn’t the case.Seeing the situation in its entirety makes more clear the fact that the employer/employee relationship is actually an even exchange with no power disparity. As mentioned, all voluntary trades, including the trade of labor for money, put both parties on equal standing, and are “win-win”. Both the employee and the employer profit. That is, the employee gains something more valuable to them than what they put into the transaction, as does the employer. If this were not the case, the trade would not take place at all. In matters of truly voluntary exchange (wherein neither party was coerced to participate), there is zero power disparity, because neither party can force the other to do anything, and both parties can walk away at any time. An employer wants the services of the employee just as much as the employee wants the services of the employer (AKA “the job”). Employees are able to fire their employers, not just the other way around. It has become fashionable (or perhaps it is a result of our tendency to support the apparent underdog) to stereotype businesses as reckless beasts who throw employees around like an endless supply of rag dolls, but the reality is that employees have just as much power to influence their employer, make or break the company, and fiercely negotiate terms of employment. Persistent communists often argue that this evaluation is unfair because it only considers an already capitalistic society (private ownership of “the means of production” wherein trade is the standard way to obtain equipment. They argue that capitalists fail to comprehend a society wherein “the means of production” (lawnmowers, factory equipment, etc.) are not privately owned but owned by the community as a whole. Supposedly, workers would create lawnmowers without expectations of direct compensation but out of the goodness of their hearts and their love of the community. Everyone would take care of everyone, and nobody would own anything except “personal property” (toothbrushes, etc.). So, instead of “paying” directly for landscaping services, workers are taken care of in a societal “package deal”. The Voluntaryist/anarcho-capitalist response to this criticism is simply, “I don’t think that system will actually work, but go ahead and start a commune, just leave us alone”. As we all know, there is no free lunch. Paying for lawnmowing services and lawnmower production must be compensated somehow, whether it is by individuals alone or through the aforementioned social “package deal”. There is nothing wrong with voluntary communes, and AnCaps are perfectly willing to tolerate different societal structures (as long as property rights are respected). That being said, there’s also nothing wrong with private production and trade; if people want to invent, design, engineer, produce, and sell lawnmowers privately, nobody else has the right to stop them. If communists attempted to seize the lawnmower factory (as they are known for), the factory owners would be completely justified in using force to stop the attempted theft. Of course, if the capitalist truly is a wholly unproductive, parasitic leech, then he or she will likely be undercut in very short order. Workers are free to band together, jointly purchase equipment, and start their own “worker owned businesses” and compete with privately owned companies. However, the vast majority of companies remain privately owned, usually because they are more efficient.